Note: If your team is part of a TeamSnap for Clubs and Leagues account, please contact your league administration for assistance with transferring team ownership. Team owners have the ability to transfer ownership of their individual team to any active roster member that has manager access to the team. Team owners cannot be removed from a team by anyone else. They must transfer the team and then leave the team once the new owner takes ownership. During the transfer process, the team owners payment information will be removed from the team and the new owner will be prompted to enter their own payment information. The new owner will be responsible for any future team billing. Any changes made to the team's plan before the transfer will take effect immediately. 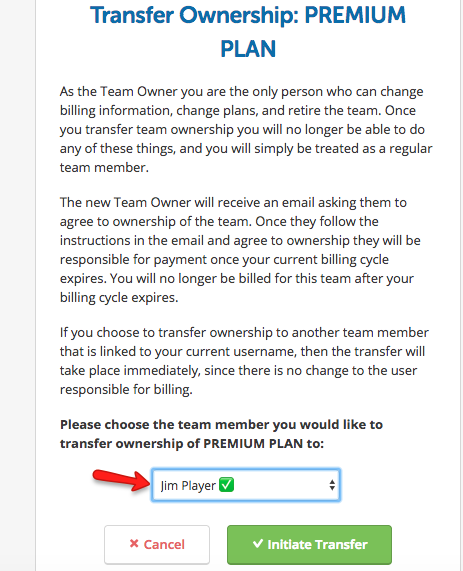 If the original team owner’s roster profile information is simply replaced with the new owner’s information, ownership will not be transferred since that profile is still connected to the original owner's TeamSnap account. The information will need to be changed back to the original owner's, then follow the steps outlined below. The new owner will then receive an email to accept the transfer. 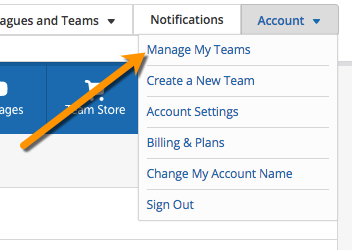 Ownership offers can also be viewed and accepted on the team home tab by clicking View Offer on the right side of the page below the Status Report section. Once accepted, the original owner will remain on the roster as a manager unless they leave the team or are removed by the new owner.